I think the feature reads really well and I love the pictures. You have a gorgeous family and I'm so happy that you were able to recover from such a dreadful illness. Hopefully your story will inspire and provide comfort for all the women out there who suffer in silence from PND. I remember reading your amazingly powerful post on your blog about attempting to take your own life in the throes of PND. 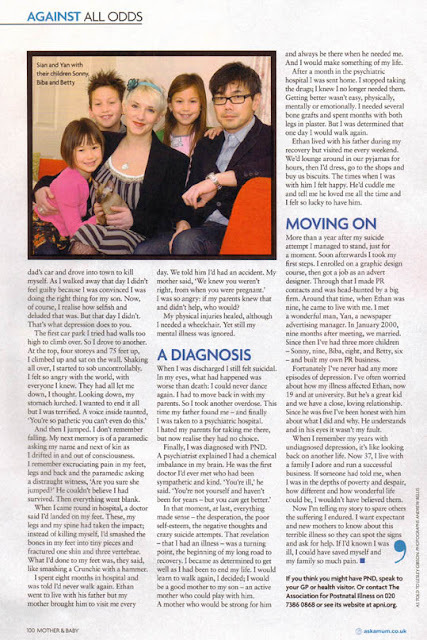 I am so glad M&M magazine is highlighting this illness so other mothers and mothers to be can be more informed about it and so grateful there is no more (or at least much less) sweeping it under the carpet these days. You and your family look ultra stylish. What a great family! You and your family look fabulous, no way could I look that good after burning the midnight oil!